The Big Society Broadband project was set up by INCA, the Plunkett Foundation and ACRE to support the development of local next generation broadband schemes. The project was supported financially by the Nominet Trust. The idea for the project came from INCA based on an analysis of the problems of getting next generation broadband rolled out as quickly and widely as possible. Quite simply neither government, nor private industry alone - or even together - can marshal the scale of resources necessary to do a future-proofed job covering the whole country. Therefore other sources of public, private and community investment have to be brought to bear, making this a challenge that can only be addressed with a 'Big Society' approach. To create models that can be replicated and scaled up to meet the needs of millions of households and businesses around the country that will otherwise struggle to get next generation 'superfast' broadband services. To foster sustainable partnerships between public, private and community sector organisations that can help bring about next generation broadband services. The project partners bring together a unique set of skills. INCA, initiated in 2010 by the Community Broadband Network, represents a broad range of organisations promoting next generation broadband projects. The Plunkett Foundation has a long history of supporting the development of rural community enterprise. ACRE has an important remit in fostering local rural economic and social development, including rural broadband. Although the problems of rural broadband feature heavily in the project's work, the Big Society Broadband project also aims to support urban projects working to develop next generation broadband services. The first activity was the development of a comprehensive online Knowledge Base to assist those developing projects. 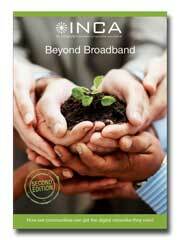 This built on INCA's very successful 'Beyond Broadband' guide first published in late 2010. The second activity was to work on project development on the ground led by the Plunkett Foundation and partners. Models are being developed from this that can be applied in different communities and settings. The third activity was to promote this approach widely through ACRE's rural community action network, through conferences and events and direct contact with communities, industry and the public sector. Spreading next generation broadband services throughout the country is a big job. We aim to play a useful role in helping bring this about and we welcome your support, your ideas and your help.